Contracts for home sales fell 1.8% in August to an annual pace of 5.05 million houses, the first slowdown in five months, the National Association of Realtors reported. The trade association cited fewer all-cash deals from real estate investors but pointed to more potential for first-time buyers with price increases easing and inventories growing. On a year-to-year basis, sales dropped 5.3%. The median price rose 4.8% from the year before to $219,800. 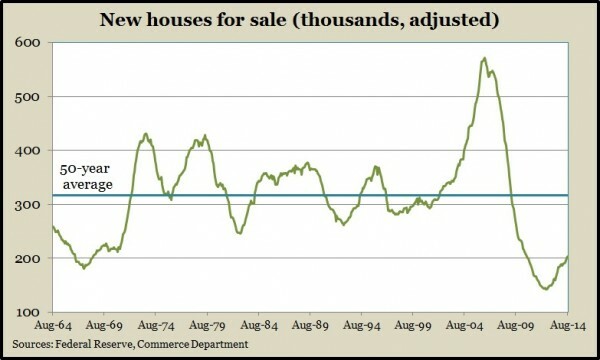 The annual rate of new-home sales grew 18% to 504,000 houses in August, the fastest pace since May 2008. The Commerce Department and Housing and Urban Development reported the supply of new houses for sale remained just above the 200,000 level for the second month in a row. Inventories had been below that level for more than four years, which hadn’t happened since the lats 1960s. Low supply could pressure higher prices and motivate more housing construction. Commerce said durable goods orders dropped 18.2% in August after rising 22.5% on extraordinary commercial aircraft orders in July. Excluding volatile transportation orders, demand for durable goods gained slightly more than expected and recovered a decline in July. Non-defense capital equipment orders, excluding aircraft – a proxy for business investing – also rebounded from July. The four-week moving average of initial unemployment claims fell for the second week in a row, nearing the eight-year low reached last month. The Labor Department indicator has remained below the 47-year average ever since the end of 2012, suggesting employers continue to be reluctant to let workers go. The U.S. economy grew at a 4.6% annual pace in the second quarter, the most since the end of 2011, after dropping 2.1% in the first three months of the year, the Bureau of Economic Analysis confirmed. The Gross Domestic Product received more help from business investment in equipment and structures than previously estimated. Consumer spending rose by a 2.5% annual rate, and inflation remained subdued, indicating the expansion isn’t going too fast. Consumer sentiment rose in September to its highest point in 14 months, according to the University of Michigan and Thomson Reuters. Survey respondents raised expectations for the economy in the next six months while continuing to indicate strong sentiment toward current conditions. Economists watch consumer sentiment as a harbinger of the personal spending that drives about 70% of the gross domestic product.